By now you’ve hopefully read all about the Asus Xtreme GlobalSummit competition we’re running, and marvelled at the excellent selection of hardware prizes on offer. Unlike most of the competitions we’ve run in the past, this one adds interesting experience to the mix – firstly, there’s an afternoon in London talking with Asus’ R&D team, playing games and tinkering with the latest hardware. It’s also about communication. Asus has a great reputation for the design and innovation that goes into its motherboards, and the firm is keen to get the opinions of real enthusiasts (hence the blogging/forum posting part of the competition), and to give you a peek behind the scenes of the design and development process. Read on to find out more, and for your chance to win one of the first five tickets for the event! Asus was founded in 1989 and has since grown into a behemoth that now sells 23 million motherboards year, and it means one in every 3 PCs in the world is using ASUS Motherboard. These range from simple, budget boards to the complex, heatsink wrapped overclocking monsters from the Republic of Gamers (RoG) range. Grand claims, but as we frequently observe in reviews, it can be tricky for motherboard manufacturers to come up with new ideas for their boards that do actually improve the design. Asus has recently had plenty of success, though – its designers spend a lot of time working on board layout, circuit design and material selection, which all contribute to overall performance, stability and overclocking abilities, As a result, both bit-tech and Custom PC have, over the years recommended multiple Asus motherboards. These are all factors which have helped boards such as the P6T Deluxe do well in reviews. Recent models have also seen the introduction ‘Stack Cool 3+’, the fourth version of PCB cooling technology which Asus introduced in 2004. It involves extra PCB layers and use of copper in the board, and for better performance, the TurboV overclocking system. This software allows you to overclock from Windows, including adjusting voltages such as CPU PLL and DRAM voltages in 0.02v using software. Apparently this came about from engineers wanting to save time when overclocking in the lab testing the differences between various design iterations. At first, it was just a tool the engineers used to speed up the overclocking process. It allowed them to overclock in the Windows OS without going back to the BIOS settings screen and rebooting the system. They found that the tool can help achieve even better overclocking performances. Without running system power on self tests and the Windows self test, the engineers found the boards could reach even higher frequencies. More functions were gradually added to TurboV, including a more friendly interface and customizable profiles. 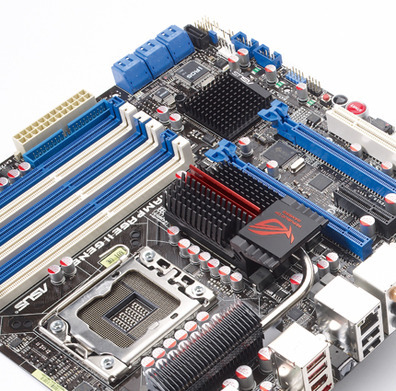 TurboV has now been officially introduced as an ASUS motherboard utility. Combined with a specially-designed board and circuit layout, it has become stronger over time. WIN WIN WIN! Now you’ve seen how Asus engineers have developed and designed new functions for their boards, we want to hear your ideas for a new feature that could be added to a motherboard. Together the bit-tech editorial team, Asus will select the five best ideas and those who submitted them will each win a ticket to the Asus Xtreme Global Summit in London on the 28th of August.